Peak Chocolate Shark Tank pitch was going so well, until it didn't. Raph and Rory were nailing their pitch. Then a Shark spotted a major flaw in the product. Raph Freedman and Rory Boyden looked like they had it in the bag. The first pitchers on tonight’s episode of Shark Tank, the personal trainers and business partners appeared to have sweetened the shark’s with their high performance chocolate, Peak Chocolate. On paper, it sounded great – a product that took advantage of the three booming markets of coffee, dark chocolate and energy supplements to combine all the elements for the ultimate pre-workout snack. As gym owners and keen crossfit-ers, the pair created the product out of their frustration of having to keep running out for coffee and mixing protein powders to meet their needs. "We&apos;ve not just created a new product, it&apos;s a new category entirely," Freedman told the sharks. 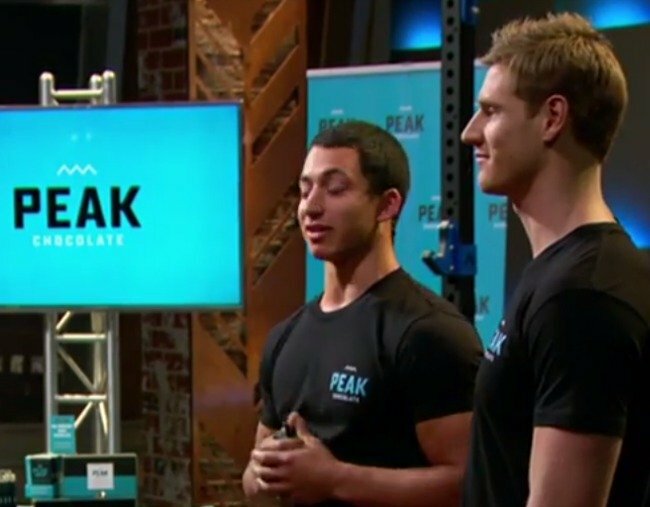 Thanks to their duo&apos;s contacts and standing in the health and fitness industry, in just nine months Peak Chocolate has earned $65,000 in sales and amassed 1,000 customers and 50 retailers. Owning three Crossfit gyms together already also gave them a proven track record of being successful in business. Even after tasting, the sharks remained impressed. Then Boost founder Janine Allis took a closer look at the product. "Have you got advice on packaging? It says here &apos;Engineered to accelerate muscle growth and increase in energy levels&apos;. Have you had legal advice on this? Have you got clinical trials to prove that?" she asked. While Freedman was two subjects away from completing his law degree, Allis said it wasn&apos;t enough. "You are screwing up big time here. Have you got proof that this does what it says it can do? It&apos;s misleading...you are making health claims that aren&apos;t proven, which means it&apos;s against the law." The pair explained that the claims of being scientifically proven referred to the individual ingredients and elements but they had not conducted clinical trails on those brought together in their Peak Chocolate. Unfortunately, that proved to be a deal breaker for all the sharks... save for Allis. Listen: Janine Allis, mother-of-four and accidental entrepreneur. Post continues after audio. "I do like it and I think we can get across all of that. I do really like it and I do want to do a deal," she said. However while she said the backing for the health claims could be overcome, she remained concerned over what the pair would do with their existing gym business should they choose to focus on Peak Chocolate after claiming they could do both. "The only way you&apos;ve got three successful gyms is because you put your heart and soul in it. And by you having a split focus, that is a fundamental flaw in this being a success. I&apos;m out," she said. Here&apos;s wishing Peak Chocolate further success in the future. For more Shark Tank stories, head on over here.